Originally published by the Johns Hopkins University Press and now available through George F. Thompson Publishing! Renowned photographer Martha Strawn, the founder of "visual ecology," spent a decade traveling throughout the American South, from Texas to North Carolina, taking more than 40,000 unforgettable photographs of this incredible creature—not only in their natural habitat of swamps, lakes, and ponds, rivers, bayous, and estuaries, coastal marshes and backwaters, but also along the white sands of Florida's landscapes and highways of Louisiana's Cajun country, in citrus and avocado groves, and in new suburban and commercial developments that now encroach upon the natural order. The 151 photographs featured here are presented in a series of visual sequences, each based on a concept or feeling designed to inform and recreate a network of field experiences that are complemented by vignettes, poems, lyrics to songs, and engaging text. Here is a unique book that combines art and science, history and folklore, a land ethic and literature in order to tell the story of one of the South's most amazing and evocative creatures. Here are the wetlands and deep waters where alligators feed, bask in the sun, perform courtship dances, mate, nest, and watch over their young. Here is the story about resource management, hunting and the commercial meat and skin industries, and the increasing tension between this wild creature and the human beings they encounter on their ancient landscape. In addition to Strawn's incredible photographs and enlightened text are three guest essays that bring home the relationship between alligators and humans: "Memories of Gator Hunts," by legendary alligator hunter LeRoy Overstreet; "Living by the Wetlands," by Jane Gibbon, a respected conservation anthropologist; and "Living with Alligators," by the acclaimed ecologist J. Whitfield Gibbons. Their stories give voice to the many people—the alligator farmers and hunters, the meat and skin processors, the scientists and wildlife managers—who spend their days and nights with this noble member of the order Crocodilia and who work hard to understand and promote a mutually beneficial relationship between these two dominant species who now must learn to live together in our one living landscape. 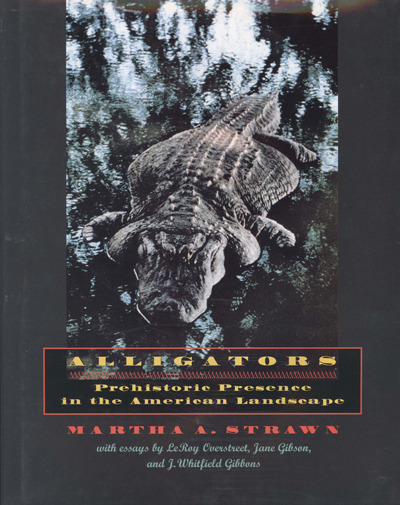 Alligators by Martha A Strawn is interesting to those who have ever seen one of these prehistoric monsters who still thrive in the Southern waters and wetlands of the United States of America. These creatures have fascinated and frightened and threatened people of all ages through all ages. This book gives all the gory details of living near alligators: how to catch and kill and cook and eat them! (Yes, they taste like chicken...I have eaten them!) The habitats, history, fertility, management, pollution, and all aspects of their life cycles are thoroughly described. There are many farms and ranches which actually want and grow these gators. Industrial uses of their meat, skins, etc. are plentiful, so they make money for people, and they are a big tourist attraction. Although the photos on every page of this book are large and intriguing, they are a bit dark, but you'll still enjoy perusing the photos and reading the detailed, informative text. Whoever thought someone would write a whole big photography book about gators!